DART regularly studies the North Texas area and determines what areas would be viable options to consider implementing regional transit infrastructure, such as the Cotton Belt or the D2 Subway. These areas are called potential transit corridors. They are generally linear areas that can be made better with enhanced transit choices. There are many factors to consider when identifying potential public transit corridors. And, it can take years to advance a major project. That’s why DART thinks about them far in advance when proposing potential larger transit projects. All corridors should possess the ability to draw in and serve a substantial population. Cost is a factor DART considers when building new transit project. Making sure we balance cost with benefits keeps our transit system effective and sustainable. Transit planners use this tool to understand where transit would be most competitive and to help determine how to allocate resources and service. Current and future population is important since that is where we draw our ridership from. Understanding where people live and how they would benefit from transit is important when considering new corridors. Businesses of all sizes set up shop in North Texas. But how can we ensure that the transit infrastructure is in place to serve these workforce centers? Understanding employment density is critical as part of transit’s role is delivering residents to jobs and enhancing their job opportunities. Is there space for a new corridor? What is traffic like near a potential corridor? Is there space in the street or existing rail? These questions must be answered as DART maps out new public transit corridors. Different corridors can present a diverse set of engineering challenges. Soil, geography, underground utilities and above ground structures can present obstacles when building public transit projects. Attractive transit corridors have an opportunity for development opportunities. Transit can drive new investments and mixed-use areas where people can live, work, and play. DART considers the environment and surrounding community when evaluating a potential transit corridor. 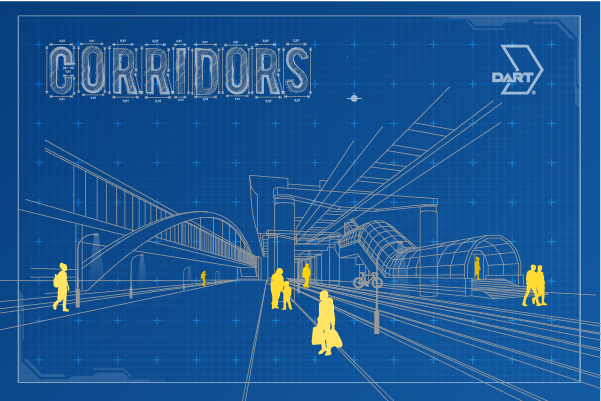 DART seeks to find corridors where transit can fit seamlessly into the surrounding landscape and community. Collaboration among the public and DART is paramount when choosing a new transit corridor. Ideal transit corridors are those that best balance everyone’s interests and brings the greatest amount of benefit. 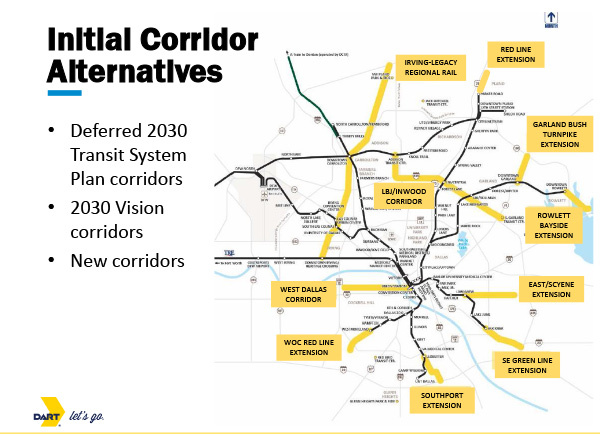 A map of initial corridor alternatives evaluated by DART is below. A strong inter-connected multi-modal system will allow North Texans to move flexibly and comfortably around the region. Mapping out corridors will help DART and local communities remain mindful and thoughtful as we plan ahead and think about how transit can help shape the continued growth of our region. Is it possible for there to ever be a rail line that connects Forest Ln. Station to LBJ Skillman Station? There are no current plans for such an extension. We desperately need to start linking east and west and get some trains up to Plano legacy area and fresco. I’m sure companies such as Toyota would sponsor stations at thier facility if done right. Ti is a missed opportunity since the station is so far from entrance to the company. Gottget transit to where folks want/need to go, not just near it. Go to D.C. And look at stations such as pentagon city. Station is in the mall, making it a destination that folks can easily get to for work and shopping. Because he station is in the mall, protected from weather, people take metro there when weather is bad. Dart is a big system but in most cases, fails to stop where we need Togo. Trains to state fair are packed because the rail station in right at the entrance, if it were blocks away, I don’t think many would ride.